Join us at the A.G.M. & Vendors’ meeting to be held this Thurs. May 1st, 7:00 p.m. to 9:00 p.m. Vendor applications & payment are due this Friday, May 2, 2014. Join us on Facebook & Twitter for updates and information! 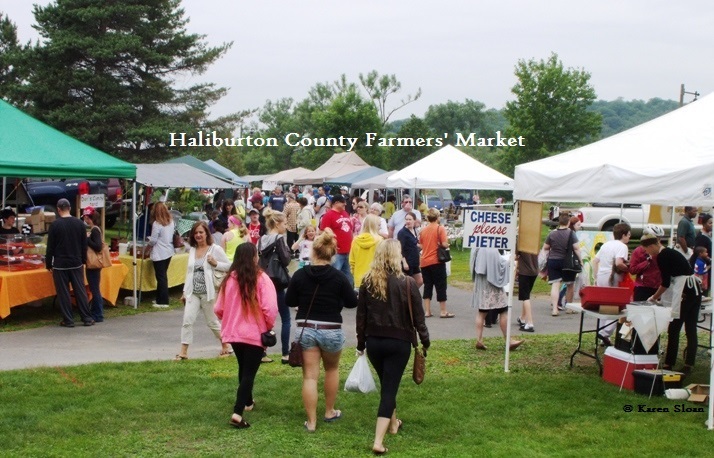 Haliburton Village market – This year the market in Head Lake Park will open on: Tuesday, May 20th, 2014, running until Tuesday, October 7th, 2014 – 12:00 p.m. – 4:00 p.m.
Carnarvon market – Located beside Rhubarb Restaurant (formerly ‘That Place in Carnarvon’), the market dates start Friday, June 20 to Friday, October 10th – 1:00 p.m. to 5:00 p.m.
An ‘incrEdible’ Haliburton County Farmers’ Market update for 2014! Spring is just just around the corner and the Haliburton County Farmers’ Market will be upon us before we know it! With this in mind, we’d like to share an information update for the 2014 ‘incrEdible’ market season. Haliburton Village market – This year the market in Head Lake Park will open earlier: Tuesday, May 20th, and it will run until Tuesday, October 7th, 2014 – The hours are from 12:00 p.m. – 4:00 p.m.
Carnarvon market – Located beside Rhubarb Restaurant (formerly ‘That Place in Carnarvon’), the dates are from Friday, June 20 to Friday, October 10th – The hours are from: 1:00 p.m. to 5:00 p.m. Completed applications and payment is due on Friday, May 2, 2014. Join us on Facebook & Twitter for updates and information, too! (Please share this post with anyone who may be interested!) We look forward to seeing you soon.